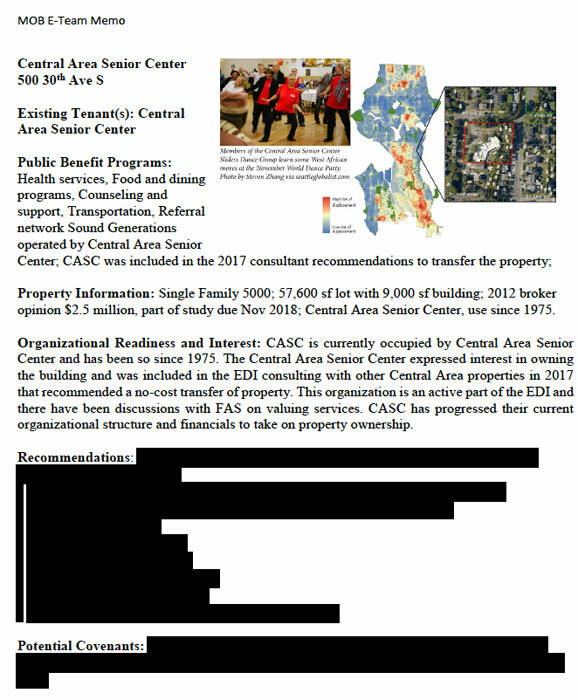 Mayor Jenny Durkan’s Mutually Offsetting Benefit team is asking nonprofits to provide extensive documentation showing they could handle maintaining and operating city-owned properties if they were transferred over to them, but memos obtained by the Madison Park Times show recommendations for what to do with the buildings have already been made. The Central Area Senior Center (The Central), Byrd Barr Place and Greenwood Senior Center leadership met with the interdepartmental team on March 13, where a MOB Eligibility and Evaluations Criteria form was shared. The MOB Eligibility and Evaluations Criteria requires tenants of these mutually offsetting benefit buildings to demonstrate they are organizationally and financially prepared to discuss a property transfer with the city. The Seattle City Council passed a green sheet during last year’s budget session calling for these properties to be transferred to the nonprofits by March 31. Negotiations now appear to have been pushed to a June 30 deadline to allow nonprofits to compile the information requested in the MOB Eligibility and Evaluations Criteria. The MOB interdepartmental team, which was formed last September, consists of representatives from the mayor’s office, Office of Economic Development, Office of Planning and Community Development and Finance and Administrative Services. While the mayor’s office maintains that no decisions regarding property transfers will be made until documents provided by the nonprofits are assessed, memos provided to Durkan — prior to issuance of the MOB Eligibility and Evaluations Criteria to the nonprofits — reveal recommendations for selling, leasing or holding the properties have already been submitted. Those recommendations were redacted in documents provided to MPT through a public records request. CASC has been working toward acquiring the property at 500 30th Ave. S. for the past five years. It would allow The Central to expand to better serve seniors and the greater Central District community. The building has operated as a senior center since 1975 and is frequently used by the Leschi Community Council. It was originally constructed in 1959 to serve as the Christian Science Church. Among the public benefits the MOB team identified being provided by The Central are a foot clinic, fitness classes, nutrition workshops, counseling, transportation, and food and dining programs. A portion of the building’s purchase by the city was completed using $1.1 million in state Referendum 29 funds. A broker valued the property at $2.5 million in 2012. One MOB team memo suggests looking at the property value separate from the Referendum 29 funds, or as a $1.4 million property. The Central notes in its response to the MOB interdepartmental team that no Referendum 29 funding would need to be returned, as the building would continue serving as a senior center as it was prior to the city purchasing the property. The senior center cites Washington code related to transfers of real property and facilities to nonprofit corporations (RCW 43.83.410). The Central pays about $250 per month for its month-to-month lease with the city, and notes in its response that the city has not kept up maintenance on the properties it is considering for transfer. The MOB memo lists recommendations for either selling, leasing or holding the building, plus potential covenants, including conditions on future development, all of which were redacted, as were recommendations for other city-owned properties being considered for transfer. The Central executive director Dian Ferguson tells MPT she plans on providing the city with some new information, but is primarily focused on advocacy and generating community support for the transfer. The Central Area Senior Center will host a community meeting to discuss its potential acquisition of the city property in which it operates from 6-8 p.m. Monday, April 15. Documents do show a restrictive covenant agreement drafted for the Phinney Neighborhood Association, which operates the Greenwood Senior Center, which commits it to continuing to provide social services to the public. Under the covenant agreement, any development or redevelopment would have to include affordable housing, and all maintenance and property insurance would be the responsibility of PNA. Developing affordable housing at The Central site has already been determined to be unfeasible.